Provide comfort for the family of Doris Schaefer with a meaningful gesture of sympathy. Age 94, of Savage,went to meet her Lord on January 31, 2019. She was preceded in death by two husbands, Alvin Lamont Crawford and George Tinus Schaefer; daughter, Virginia Ryan; brother, John Smith; and granddaughter, Shannon Riker . 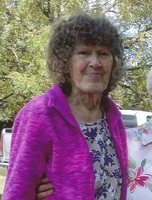 She is survived by her other brother, Robert (Fran) Snow; her daughters, Carol (Mark) Jenkins and Jane (Chuck) McCall; step-children, George (Nina) Schaefer, Douglas (Peggy) Schaefer and Sharon (Frank) Webb; 10 grandchildren; 15 great-grandchildren; 2 great-great-grandchildren; and many nieces , nephews, cousins and friends. Funeral service will be Saturday February 9th 3:30 PM at Mt. Olivet Church, 5025 Knox Ave, Minneapolis. Visitation 1 hour prior to service. Interment in the spring. In lieu of flowers memorials may be made to Jane McCall with proceeds going towards funding a clean water well in a third world country in memory of Doris. To send flowers in memory of Doris Virginia Schaefer, please visit our Heartfelt Sympathies Store. Provide comfort for the family of Doris Virginia Schaefer by sending flowers. Mother, we will miss your smiling face each morning at the table. No matter what we had planned, "coffee first" was always your motto. From the minute your feet hit the floor, it was coffee, healing scriptures, Bible reading and morning newspaper in that order. You are my best friend and I miss you terribly, but we will see each other again by that beautiful shore where the charming roses bloom forever. Now is just a temporary interruption. I love you. Your "beautiful redhead"